Housebroken: Yes, but needs to be reinforced. Owner had dementia and would forget to take him out. Just needs to reminding him until he learns again. Sam is a 9 year old male who was surrendered by his owner because he had to move into senior care. His owner was heartbroken to give him up. He is fairly inactive because he used to sit at his owners feet. He is good with children, but they aren’t sure about dogs or other cats because he hasn’t been exposed much. He is used to roaming the house free and sleeping wherever he ends up. He is potty trained, but because his owner had dementia he got out of routine and needs reinforcement initally. He is submissive and just wants L-O-V-E! Please help us find Sam an amazing home for the rest of his years. Newest update from Foster home – Sam here. I’m still at my foster mom’s house waiting for my forever home. While here I’ve been learning to become part of a family. I am proud to report I’ve made tons of progress!! I now like all my foster pug sisters. Before I didn’t give a hoot for them! Other pugs are cool in my book now! It’s great having friends. I love following them around. I’m still a low key guy though. I don’t need to be top dog.I’ll leave that for the younger generation. I’m super affectionate and handsome. I have my own bed which I love. I don’t jump up on anything. I’ll greet you w/a pug smile and a bark when you come home. I still have my dry eyes which need drops a few times per day. I also need my home furnishings to stay in the same place since I don’t see very well. My foster mom changed the house around the other day. That was not cool! She forgot to tell me and I found out the hard way. I like to eat only once a day and I prefer soft food. My foster mom encourages me to wear a belly band in the house sometimes. I actually only need to go 2-3 times a day. I don’t hike my leg either so the walls are safe, maybe not the floor all the time though. The swifter wet jet mop is handy I’ve heard. I love to sit outside and near my foster mom in the house. I love car rides and am a good rider. I still get nervous in new situations though. My foster mom thinks it’s because my eye sight is poor. There is nothing wrong w/my hearing though. Say the word treat and I’m there! I like being brushed. Nothing like a good scrubbing. I’ve lost a lot of weight and am now a lean 18 – 20 lbs approximately. I look good! If your looking for mature guy give my foster mom a call. I’ll be waiting. My husband and I live about half an hour south of St. Louis, Missouri. 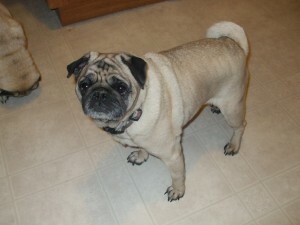 We have two female rescue pugs, approximately 6 and 9 years old, Chevi and Lucy. You can see them on my facebook page (peggy hollingsworth linhorst). We also had a male rescue pug, Bandit, from the time he was 10 until he died at 14 years old (his pics are on my facebook page, too). I know, from having older rescue pugs, that medical bills can be pretty high for the seniors. Would you be interested in our adopting Sam for a lesser amount of money? I work from home and am with my pugs all day, so Sam would have plenty of companionship, and we would love to help make the rest of his life safe and comfortable in a loving home. I also realize we live pretty far from Omaha, so we would need to look into transportation, but I shared his pic and story on facebook and I keep coming back and looking at his face and would love to help if we can. If someone closer to Omaha would like to give him a good home, that’s great, but if not, we’d be willing to help and to provide a good home for him. Thanks, Peggy Linhorst.